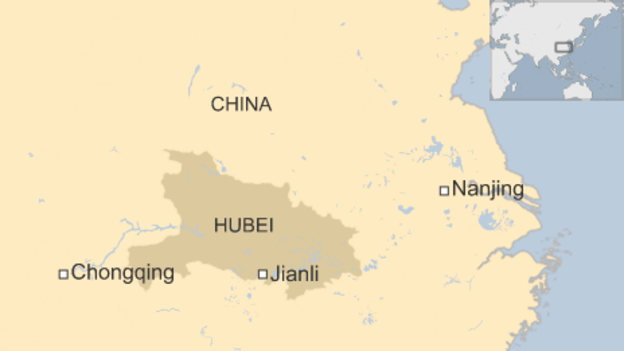 Jo Floto: "The captain is reported to have said they were struck by a cyclone or some kind of tornado"
Five people are dead and hundreds are missing after a ship carrying more than 450 people capsized on the Yangtze River in China's Hubei province. The ship is floating upside down in a wide stretch of river - state media said rescuers tapping the hull had heard calls for help from inside. The boat, the Eastern Star, reportedly sent no emergency signal. Media reports say the alarm was raised by several people who had swum to shore and alerted the police. Only about 12 people have been rescued so far, and some with minor injuries have been taken to hospital, said state media. Rescue work has been hampered by strong winds and heavy rain. The BBC's Jo Floto in Beijing says that China has not seen a disaster on such a scale for a long time. The government has exerted huge control over information coming out from the scene, with local journalists stopped from getting close to the scene, he adds. No doubt for some of those on the Eastern Star it would have been the trip of a lifetime. And the Three Gorges Dam, a place of pilgrimage in its own right and a powerful symbol of China's rising economic might attracting around 2 million visitors a year, now has its part to play in the rescue. The dam's engineers have been ordered to reduce the water volume flowing through the giant turbines. The sinking of the Eastern Star will resonate widely. A boat full of everyday Chinese tourists - from grandmothers and grandfathers down to the youngest listed passenger at just three years old - has been lost in the waters of the country's best loved river. 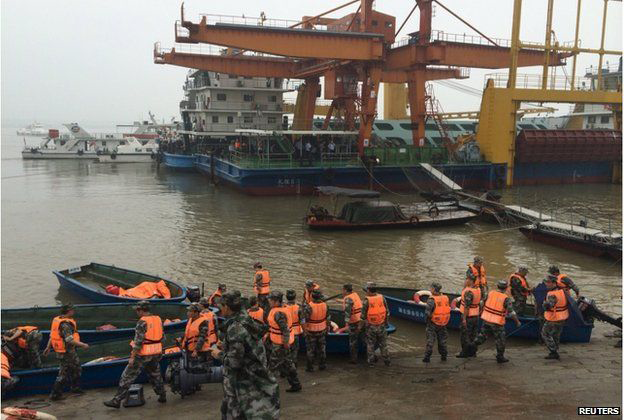 Thousands of soldiers and rescue personnel have been deployed, and a high-powered salvage ship is on the way to pull the boat upright, reported China Central Television (CCTV). 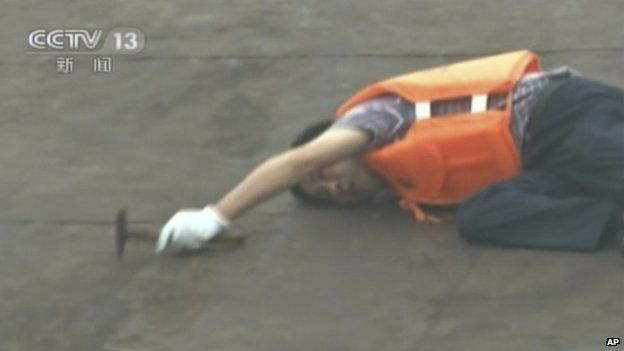 The state broadcaster said on its Weibo microblog account that divers had knocked on the hull underwater and had heard cries of help from within. 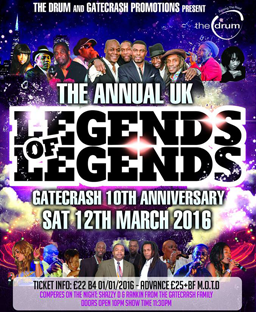 It said later that rescuers above water had established contact with those trapped inside. 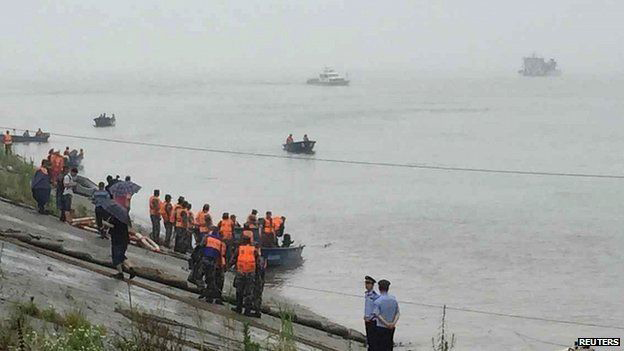 The captain and the chief engineer, who were both rescued after more than an hour in the water, have reportedly been detained by police. They were quoted earlier as saying that the boat had been caught in a cyclone and sank within minutes, while many people were asleep. 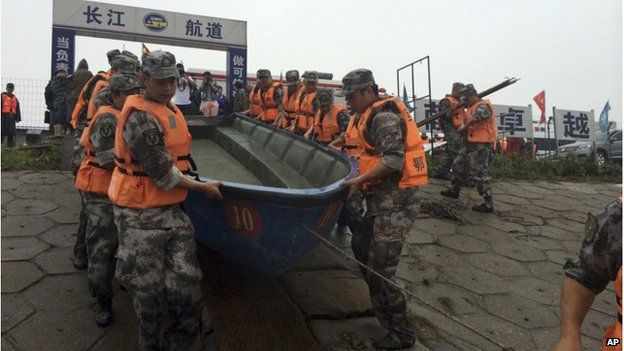 Premier Li Keqiang, who is travelling to Hubei province, has ordered a team from the state council to lead the search and rescue operation, said Xinhua. Eastern Star - Dongfangzhixing in Chinese - had been carrying 406 Chinese passengers, five travel agency employees and 47 crew members. The 76m-long ship weighs 2,200 tons, and could accommodate a maximum of 534 people. 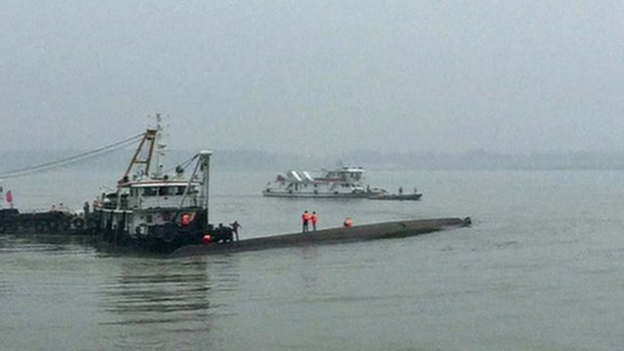 It was travelling from the eastern city of Nanjing to Chongqing in the south-west - a journey of at least 1,500km (930 miles) - when it sank in the Damazhou section of the Yangtze in Jianli county, Hubei, at about 21:30 local time on Monday evening (13:30 GMT). The water there is about 15m (50ft) deep. It took at least two and a half hours for rescuers to reach the boat. CCTV said the vessel was owned by the Chongqing Eastern Shipping Corporation which runs tours to the scenic Three Gorges river canyon area along the Yangtze river. Most of those on board were tourists aged around 50 to 80 on a tour organised by Shanghai company Xiehe Travel. Anxious relatives in Shanghai have gathered outside the company's office, which remains shut. They told reporters that calls to their loved ones on board were not getting through. Sina News reported that a young man was seen sobbing by the door, saying: "Mum and Dad I was wrong, I shouldn't have let you go off on your holiday."